Nestling within the heart of the village of Burrington this property is within easy reach of the local pub and shops. Set out on foot to explore the nearby Mendip Hills where spectacular scenery together with an array of wildlife can be admired. During your stay a visit to the historic spa city of Bath is a must with its wealth of classical architecture and wonderful selection of independent shops cafes and restaurants. Other nearby attractions include the metropolitan city of Bristol the picturesque scenery of Cheddar caves and gorge and the smallest city in England Wells. This unique multi-level accommodation displays exposed oak beams and ceiling trusses timber floors and plenty of natural light throughout. On the lowest level you will find a well-equipped kitchen area which includes an integrated oven with hob fridge with ice compartment and microwave. A washing machine is located in a small shared laundry room in a separate barn. Once prepared enjoy meals in the raised dining area which enjoys views over the patio through large French doors and picture windows. At the end of a long day on foot the cosy lounge area beyond is the perfect space to relax and make the most of the TV/DVD. The king-size master bedroom is a spectacular space which features oak flooring French doors to the garden a free-standing bath and en-suite shower room. There is also a cosy double bedroom with en-suite shower room and quirky mezzanine bedroom with twin beds perfect for children. Step outside from the lounge area onto a private secluded patio area with seating and a BBQ for enjoying al fresco meals and drinks. 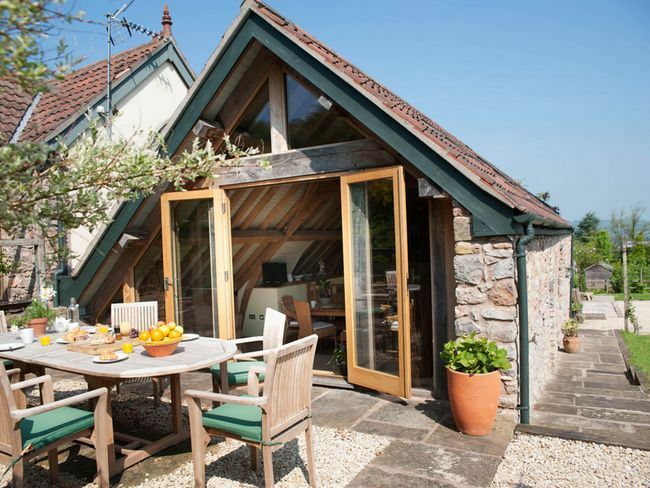 Guests also have access to a sunny shared garden which enjoys spectacular countryside views. Dogs are charged at ��20 per dog per week.